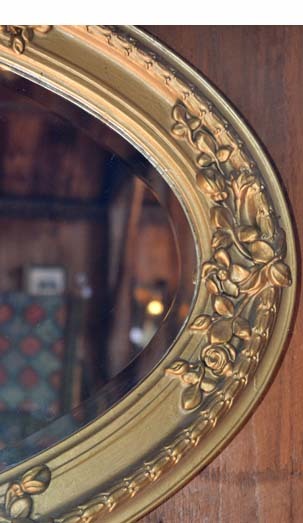 Here is an elegant Gold Framed Oval Mirror that would be perfect for decorating your home. This is an example of a great piece that you could build a room around. The frame is gold with some decoration, and it is in pristine condition. The beveled mirror is also in perfect shape and can be hung either vertically or horizontally. 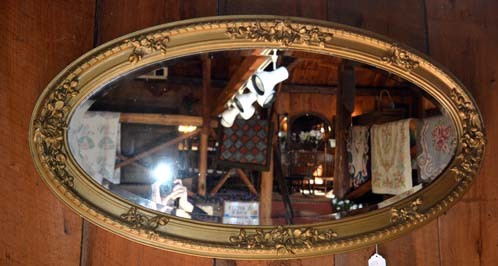 This mirror is from "The Great Gatsby" Art Deco era of the 1920s. It can add class to the surroundings without detracting from them - a great find. Decorators take notice!